Located on the far north side of Yellowstone National Park, near the Montana entrance, Mammoth Hot Springs proudly displays ancient activity still at play. Featuring an Upper, Lower, and Main Terrace to explore, Mammoth Hot Springs is a dynamic area full of color, steam, and growing geological formations. Along the boardwalk on the Lower Terrace, the cascading travertine of Minerva Terrace deserves a moment’s appreciation, as do the changing colors of New Blue Spring on the Main Terrace. Every inch of Mammoth Hot Springs is worth exploring, and chances are it will have changed if you visit a decade later. 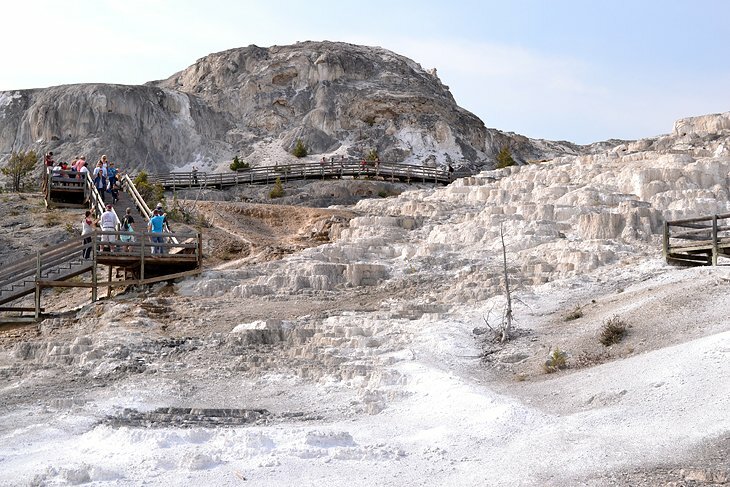 After the adventure, visitors to the Mammoth Hot Springs Terraces can continue their hike on the nearby and wildlife-rich Beaver Ponds Trail. For longer stays to explore more in the area, including the winter activities, the nearby Mammoth Hot Springs Campground is one of the best campgrounds in Yellowstone, and one of the few open throughout the year.